Meet the new generation of PTV Viswalk – with additional features and improvements that make simulating human behaviour easier and more realistic than ever before. 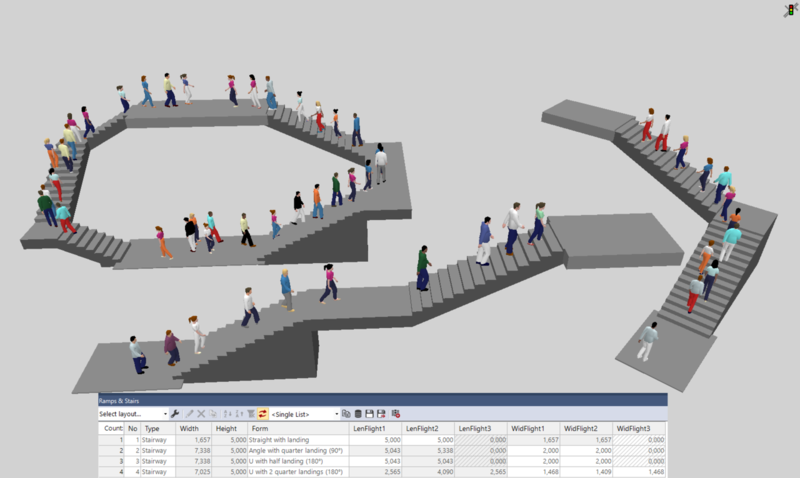 PTV Viswalk 11 simulates realistic walking between stationary or slow-moving vehicles, extends the range of stairs that can be modelled, and offers more advanced modelling options for the routing of pedestrians based on their characteristics. Want to try all the new features yourself? Take a look at our latest PTV Viswalk version and test it 30 days for free. What's new in PTV Viswalk 11? There’s a traffic jam, the vehicles are stationary, and people are walking between them to cross the street. This scenario can now be realistically simulated with PTV Viswalk 11 where pedestrians can navigate their way through the vehicles instead of just standing at the sidewalk waiting for an opening. The same principle can be used to improve the simulation of shared space environments where vehicles and people are crossing the same space. Simulating a building with complex stairs? No problem, with PTV Viswalk 11. The software covers a wide range of stairs, including those with 90-degree angles and/or platforms. What is the probability that a certain person will bypass an obstacle on the right or on the left? With PTV Viswalk 11 routing decisions can now be based on customised formulas that take into account certain attributes of pedestrians or objects. A simple example; with this new feature it can be specified that only people with a height of 1.59m or less will walk through a 1.60m high door. According to the formula, taller people will make a detour and avoid the door.